Tottenham have released a statement to clarify why Portsmouth owe them £1m for goalkeeper Asmir Begovic despite the fact his transfer to Spurs was aborted. Begovic instead joined Stoke but Spurs insist they paid £1m up front in a joint deal for Begovic and Younes Kaboul to ease Pompey's cash crisis. "Our deal was for the purchase of two players for a combined price," it said. "To help them we paid an agreed sum and concluded if he was sold or loaned to another club we'd be repaid the sum." The debt to Tottenham over a player who never played for the White Hart Lane club was one of the dealings revealed on Wednesday when the full list of Portsmouth's £119m debts was made public. It had been incorrectly suggested the £1m Tottenham were owed was some kind of sell-on clause, but Spurs have insisted they came to the arrangement with Portsmouth to try to help the debt-ridden club, and the say they are justified in their debt demand. "The transfer of Younes Kaboul was completed and Portsmouth pressed for an immediate payment in order to alleviate their cashflow situation," said the Tottenham statement. 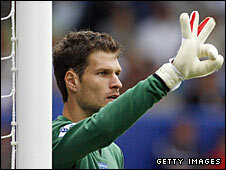 "We were assured that the transfer of Begovic would be completed before the end of the transfer window. "Our intention had been to assist a fellow club in financial difficulties whilst at the same time protecting our commercial position. "We shall continue to do the latter and trust that this statement clarifies the position."